The author is also behind an analysis project about M. Night Shyamalan‘s five films from 1999 to 2006. There are several articles on each film: The Sixth Sense (1999, here, here and here), Unbreakable (2000, here, here and here), Signs (2002, here, here, here and here), The Village (2004, here, here and here) and Lady in the Water (2006, here and here). All the articles can also be accessed through this overview. There are two articles on After Earth (2013), here and here, and two articles about The Last Airbender (2010), here and here. This is the second of four articles about Split (2010). The first one is here. The third is here. The last one is upcoming. The first article on Split was written at the time of its release, based on theatrical viewings. 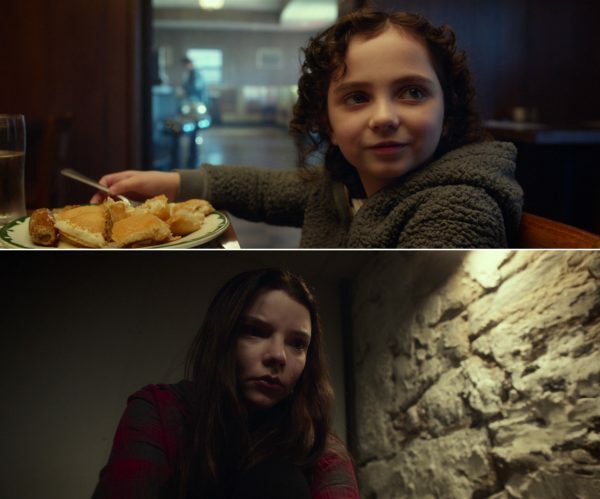 It offered a general appreciation of M. Night Shyamalan‘s film, discussed the group dynamics between the three abducted girls, and went into detail about the revelation at the end. These new articles, very much screenshot-oriented, are the fruit of analysis using the Blu-ray edition. This piece is in three parts. The first part will look at some early scenes and how they manifest both physical and mental isolation. The second part contains a shot-by-shot analysis of the abduction scene. The third part examines major motifs, mainly corridor shots, animals and flowers. 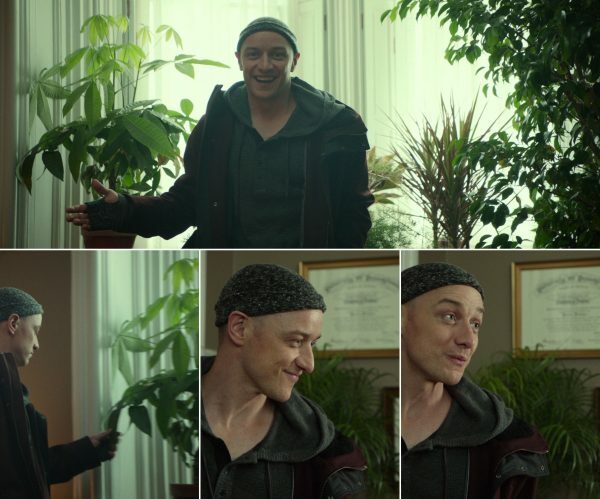 Just a word about naming: Kevin Wendell Crumb (James McAvoy) has 24 personalities inside, and I will generally use the name of whatever character has “the light” at any time. This means that Kevin, in the scope of the incidents covered in this article, will be called Dennis, Patricia, Hedwig (sometimes these three “rogue” personalities will be referred to as The Horde) or Barry. Since Dennis is posing as Barry during the three sessions with Dr. Fletcher, his real name will be used. For readers unfamiliar with the story of Split, here is a brief outline of the plot. The opening of Split is particularly inspired. We see Casey in splendid isolation from the other girls frolicking at Claire’s birthday party (in the up-market King of Prussia mall just outside Philadelphia). Visually it exerts an enduring fascination, through a device that it feels innovative to utilise as early as in an opening shot: a judicious use of a Vertigo shot, so discretely applied as to be almost invisible, but also a bit hard to get a grip on. The camera seems to be tracking out while zooming in, but in a hesitant, arhythmic, “impure” fashion, and there also appears to be some panning going on. The icky-looking plants in the foreground basically stay constant. Casey’s gaze into the camera is of particular interest. 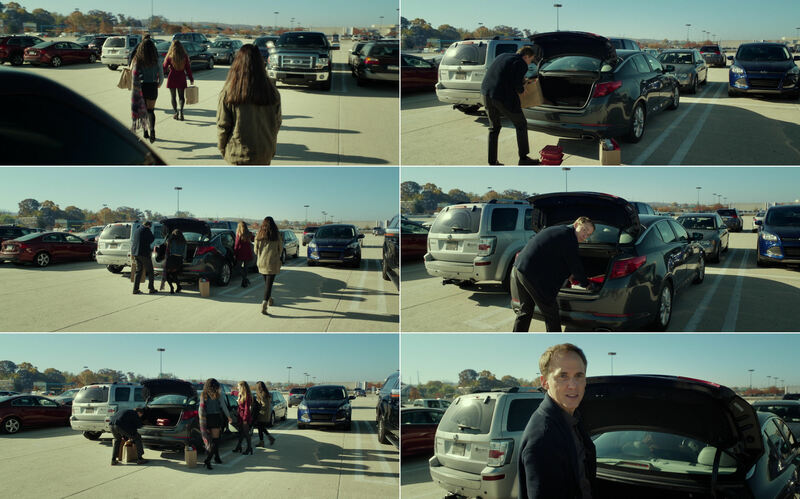 Soon, through a shot from Dennis’s point-of-view, he will follow Casey and the three others to their car, and could well have been inside the mall too, observing the birthday party. 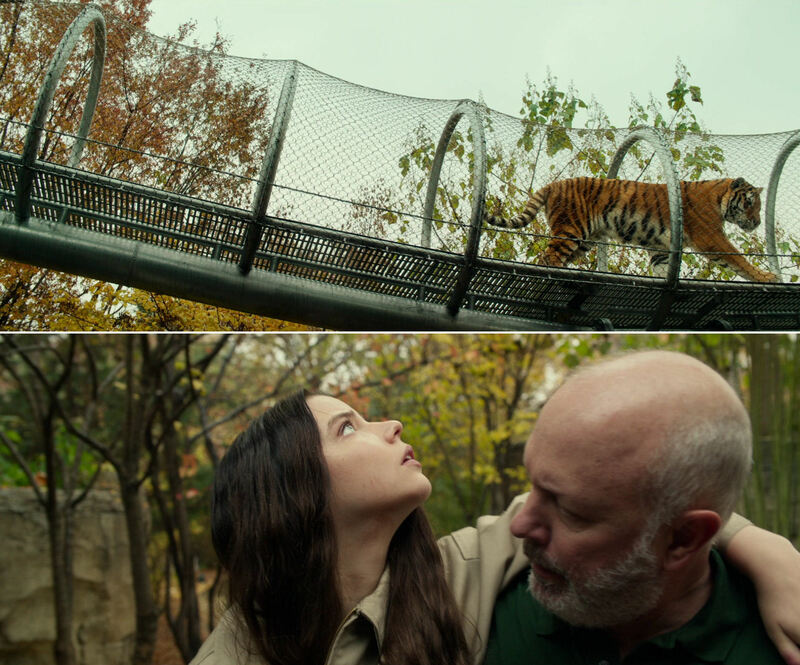 If we entertain the thought experiment that the shot represents Dennis’s gaze at the party, this means that the interaction between Casey and the villain through the whole film will both start and end with them looking into each other’s eyes – the end is their climactic meeting of minds between the bars of the cage below the zoo. 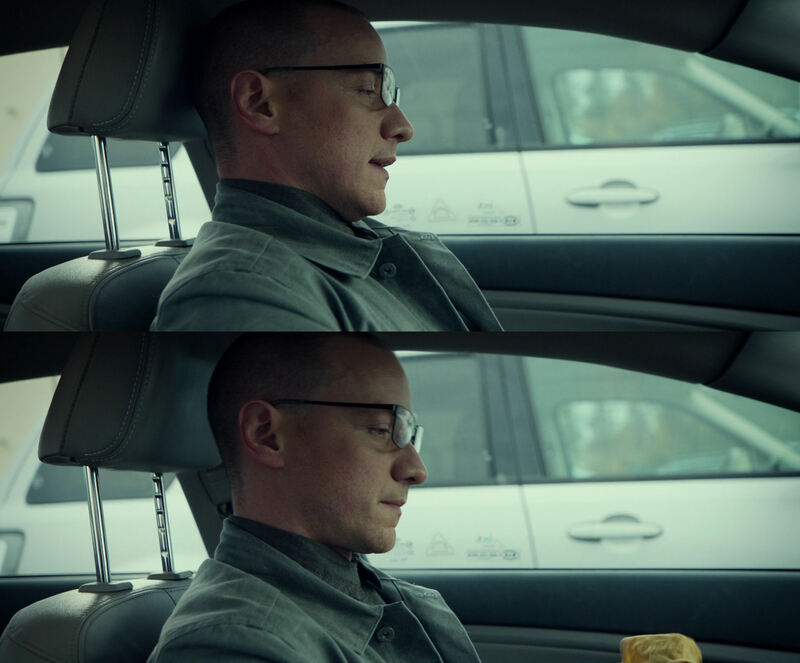 There are also some metaphoric possibilities here: if the opening shot is his gaze, the fact that it contains two simultaneous devices at odds with each other, the track-out and zoom-in, perfectly fits the situation with all the competing personalities who share the space of Kevin Wendell Crumb’s body. 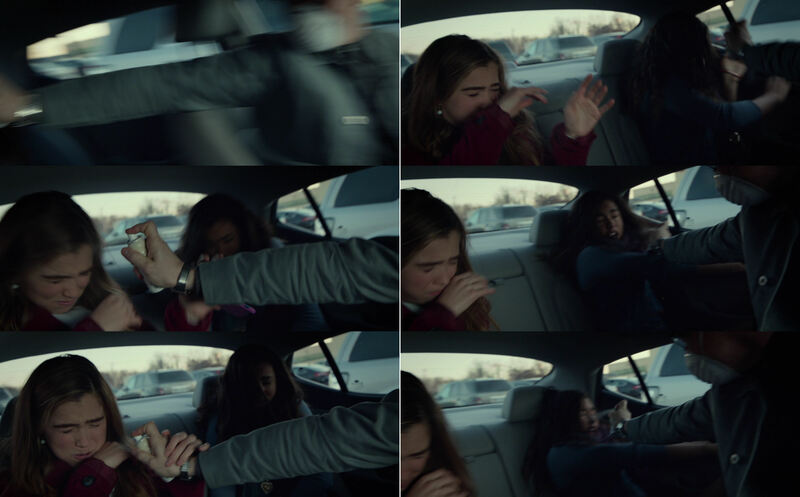 The sense of internal contradiction is subtly carried forward into the second scene, where the two other girls don’t really want Casey, the social misfit, to get a ride in the car. Claire says: “You won’t be able to hear my dad tell jokes that only he thinks are funny for an entire car ride unless you come. You don’t really wanna miss that.” Like the technicalities did for the opening shot, her irony splits the situation in two conflicting parts: it is an invitation but also a suggestion that she really ought not to come. From these “pure” screenshots, this could be three different rooms. One wall is made of very solid-looking wood, with the door in the middle – as a background, this wall is often associated with Kevin’s various personalities, as the prison guard. Another wall is smooth and bright (with the bathroom as an additional light source) – often associated with Casey, since she turns out to be “pure”. The two remaining walls are made of rough stone – associated with Claire and Marcia, because they are “impure”, and two in number since they operate and are treated as a pair. The inside of the cage where Casey finally locks herself in. 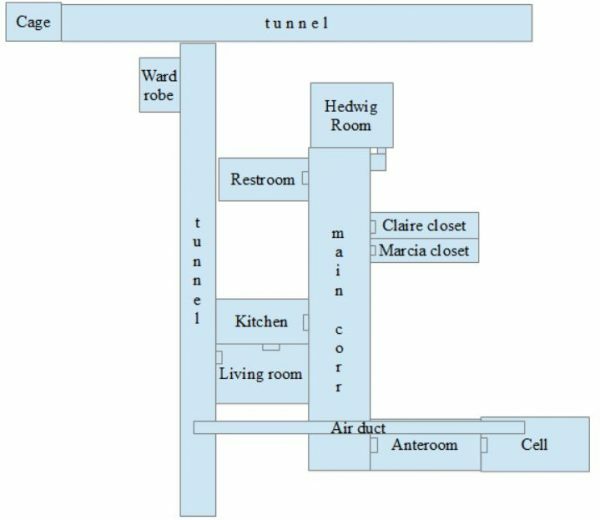 Some other split states: Hedwig’s window that is either open or closed – its fakeness might allude to the artificiality of Kevin’s personalities and their inability to escape and live full lives on their own – and the corridor leading to the basement, where only every other light is on. 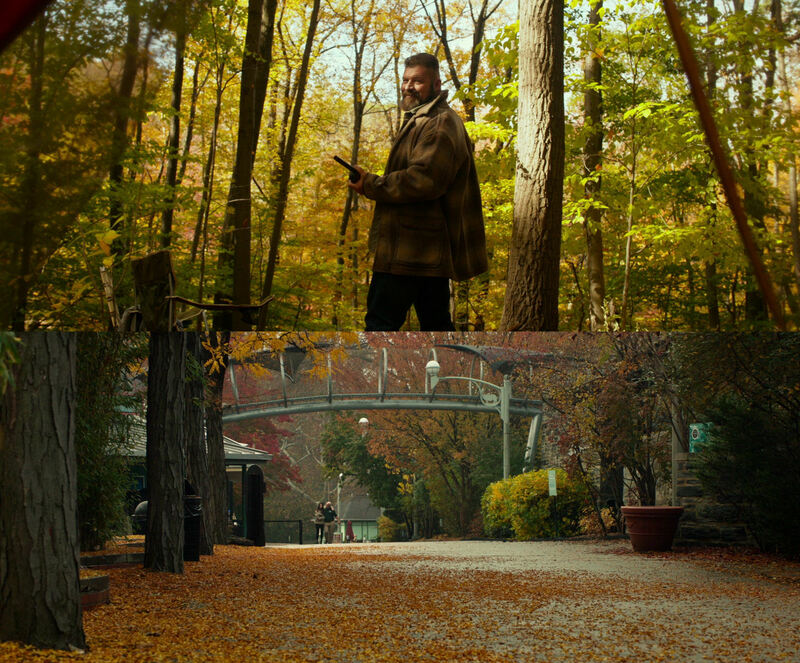 The first, second, and two stages of the third shot. Here it almost looks like the edge of the frame represents the crack: she is peering past “the shot” to see Hedwig unlocking the outer door. …but particularly in this scene the textural contrast between the walls is used to good effect to discretely reinforce the lack of common ground. She is also isolated by the positioning of the actors, and the focus contrives to put her on a separate “plane of existence”. 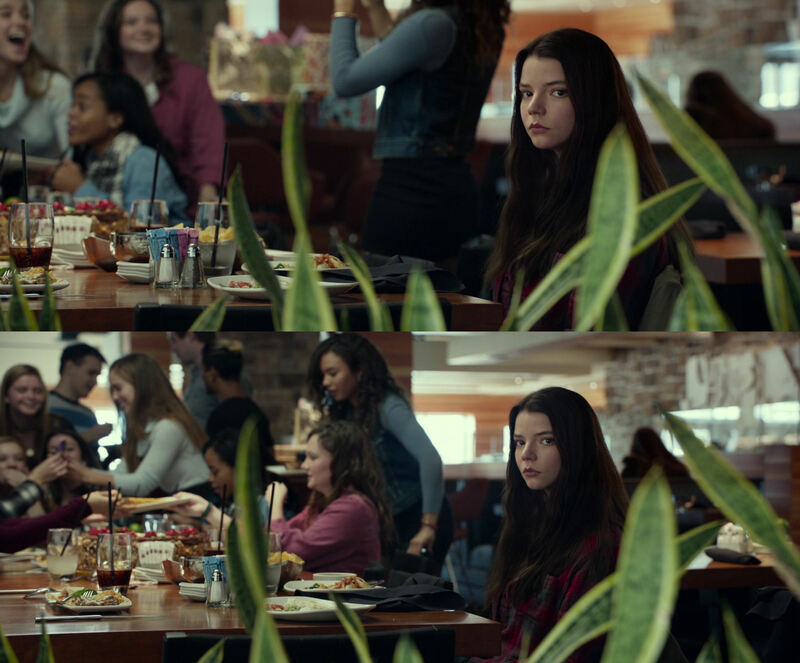 In the above shot the focus also signals Casey turning introspective, leading to the second flashback. It comes in response to Claire’s exasperated line: “Why do you act like you’re not one of us?” It is not an act, however, a core issue that Split sets out to gradually and convincingly demonstrate. After the astounding climactic unveiling in the cage, where the documentation of Casey’s apartness is carved into her scarred body for The Beast to see, his exclamation “You are different from the rest” echoes Claire’s question. We are now going to walk through the first cell scene, with a special look at the (lack of) interaction between Casey and the others, but also point out other pertinent items. The tone of the scene is a curious mix of being wholly from Casey’s point-of-view while she is also completely out of the loop, as if here too occupying her own plane of existence. We almost never see all of the captives in the same shot, and when it happens they are always separated by different depth levels or other means. All double-column montages in this chapter are to be parsed row-by-row, left-to-right. Six more shots. First they hear a noise from outside, and then react to the door being opened. 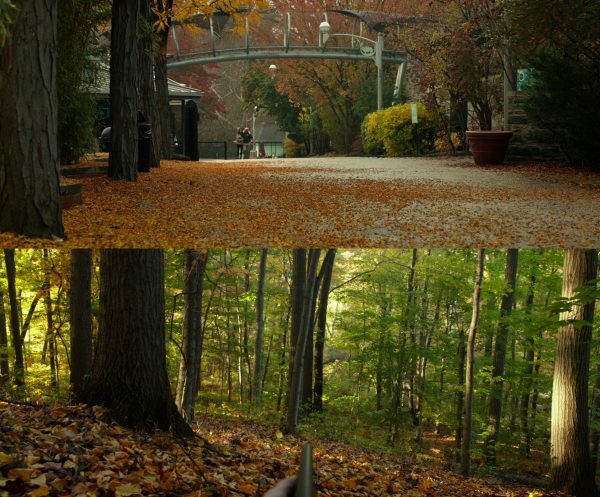 In the only two shots of the scene where they are all seen on the same level, there is a pipe separating them, neatly splitting the image in two equal halves. Now the set-up from the abduction scene in the car is repeated. It is as if Casey does not exist, everything is about Dennis and the other girls. It is reasonable, however, to assign the shots of Dennis to Casey’s point-of-view. In the below montage we see how Marcia is visually “primed” to be the victim of Dennis’s abusive attack. First, perhaps a reflex reaction to Dennis wiping off the chair, she wipes her face with her hand. Then a closer shot emphasises that she is closest to Dennis. Finally, when Dennis starts to look in their direction, she moves her hand to pull down her short skirt, an act that serves as a signal for Dennis, who immediately says: “I choose you first”. It is almost as if he is punishing Marcia for being, in his eyes, provocatively dressed, or he takes Marcia’s movement as a weakness to be pounced on, like a predator picking out the most vulnerable herd member as its prey. Eight shots in a rhythmically alternating pattern. Is it just coincidence that when Claire takes hold of Marcia, the flower behind them is revealed (Marcia is “ripe for picking”)? 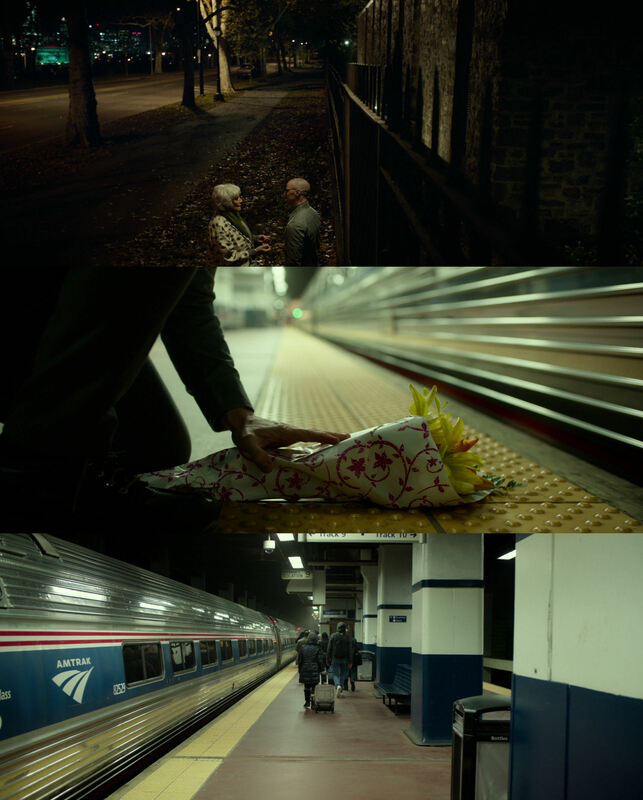 Four new shots (the last three frame grabs are from the same shot). Note the meaningful emphasis on his crotch as he walks towards Marcia. Continuing this sudden burst of “otherness”, we are treated to this perverse angle, with Marcia’s medallion swinging wildly, a chaotic moment of intimate interaction. Now the strategy shifts to long takes (this is 19 seconds), its start marking it as Casey’s POV. After Dennis has thrown Marcia out of the cell, the camera ominously tracks towards the door, behind which we can only imagine what goes on, until Claire finally starts hammering on it. First a POV-establishing shot, which also shows that Casey is beside herself, before a 17-second take. Casey’s idea worked: Dennis is roaring like an animal, as if evoking the still hidden Beast, and his OCD cleanliness makes him almost collapse, while he is shaking his wet hand. The camera pans to the right with Claire as she enters the bathroom, and continues in an arc that ends up capturing Casey. This device will be repeated twice: when she realises where the keys are so she can escape from the anteroom, and in the police car, her last scene in the film. (More about this in the fourth article.) The movement is also adding to the unreality of the situation: what we assumed to be a POV shot either was not, or turns into something else during the pan. Furthermore, the gradual change in background texture, due to the new wall, plus the extreme soft focus bestowed on Claire, indicate that Casey has retreated into a zone of her own. 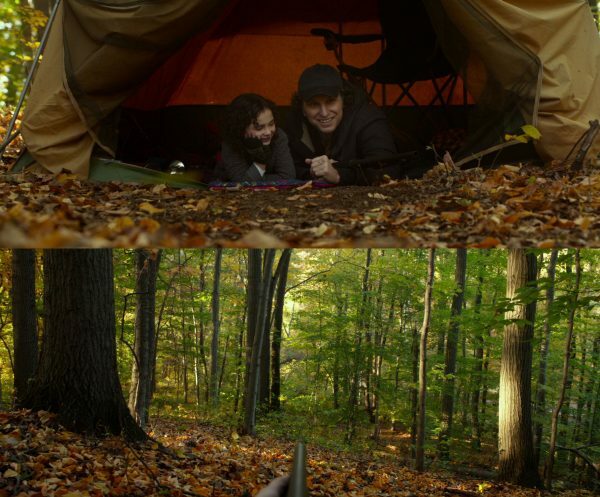 After all of Casey’s POV shots so far, it is only fitting that the shot of her uncle is immediately revealed to be from the POV of the 5-year-old Casey (plus her older self, staring into the past), and also since the abusive uncle is a parallel figure to Dennis. Furthermore, the bright opening forming the backdrop for all her 5 shots might be meaningfully linked to the bright wall and even brighter bathroom door we often see behind the older Casey, not to speak of the cell door itself. In a film obsessed with doors and escape, the opening behind the child beckons like an escape route. When the flashback ends, we see Casey from a low angle, the vantage point suggesting the 5-year-old looking up at her older, miserable self. It is also noteworthy that every shot of her in the flashback is from her proud father’s POV, excluding her uncle from that particular equation. Actually, the fact that Claire’s father and Casey’s (now deceased) father bear some resemblance – head shape, size and angle of nose, cleft in chin, distance eye/eyebrow – could have played a role in persuading Casey to accept the car ride. A slide show of more shots illustrating Casey’s separation from the others. Casey sits down on the floor to get “on the level” with Hedwig, and even though she is play-acting, she is closer to Hedwig than ever with the others. This is the only time the constellation is broken, with Casey here being grouped with one of the other girls, except when Casey and Marcia help each other block the door for Hedwig in the next cell scene. This is during a shorter period where the girls are co-operating more, but it culminates in Claire unilaterally deciding to break out through the roof, against Casey’s protests. She is partly hidden in this image, which could be telling, but not in some other shots from inside the bathroom. 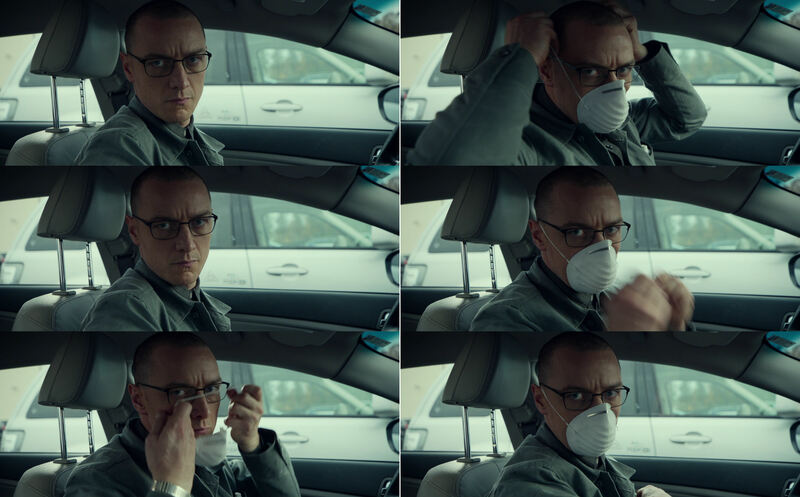 Like so often in Shyamalan, Split is concerned with confined spaces. There are three strata, all locked: the cell, the anteroom and the basement itself. 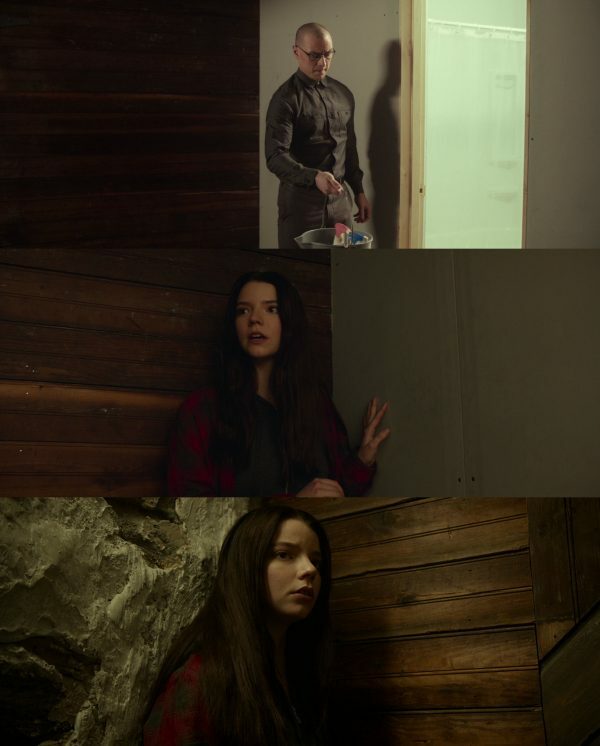 In addition we have the cage in which Casey locks herself in the climax, the wardrobe closet in which Claire hides during her escape attempt, the closets that will eventually imprison Claire and Marcia, and many other narrow rooms and corridors. Claire crawling through the corridor-shaped ventilation duct. The car of the abduction scene is a harbinger of these spaces, a tiny cell, its locked doors controlled by Dennis. In her last scene Casey is again sitting in a car, but upon news that her uncle has arrived, this time she is reluctant to leave. Another paradox: after all her efforts to escape, to avoid being consumed by The Beast she ends up locking herself inside the cage, even though its spring-loaded latch traps her, potentially for a long time. This serves as a physical metaphor for a mental state typical of how Shyamalan characters deal with past trauma: to survive extreme psychological duress they withdraw from society. The Beast bending the bars of the cage also cries out for metaphor: he strives for the breakthrough of entering the cage, but also for breaking out of the boundaries of human limitations, very much exemplified by his various weak co-personalities. The car is also an arena for another Shyamalan concern: the home invasion, unfolding in film after film. This interview describes the director’s fear of a disruption of normal life (and how his children at various ages have influenced him). In Split, however, most of the invasion has already happened: the evil mother tormenting Kevin, the guardian/uncle abusing Casey. In the car invasion, history repeats itself for Casey in a parallel version: Claire’s father is replaced by a tormentor – literally speaking, by taking the father’s place behind the wheel – who proceeds to claim dictatorial control over their lives. The first article described the abduction scene as “an outstanding example of Shyamalan’s ultra-precise ability to cautiously portion out just enough information to create a feeling of almost inexplicable underlying dread.” Its use of off-screen space is also exemplary. In a film with an ubiquitous score, music is banned here. It starts out with an overture, a 32-second steadicam shot following them to the car. After a while, as Claire’s father is acknowledging someone coming up, it is revealed as a POV shot from an unseen Dennis. This reinforces the theory that also the opening shot might be a Dennis POV shot. In this chapter all double-column montages are to be parsed column by column. Note that Casey keeps her distance, and when near the car, she walks briskly past the others, in order to claim the front seat, to avoid sitting with the other girls. Nothing to see in the mirror, which is somehow unsettling. As this mini slide show reveals, there is a very slight forward movement, which might be intented to cause some tiny subconscious eeriness. This is one of many “invisible” subtleties in the film. Slide show: the scene is structured as a ritual, for now we look into the mirror again. The forward movement is greatly escalated, and the focus is also racked inside the mirror. The new visual information is very unsettling: why is left-over food from the restaurant now spilled on the tarmac?! At the same time the utter mundanity of the items is disarming. The red colour, however, might signal danger. Also, there are three boxes, two close together and one further away, the number and placement corresponding to the girls and their position in the car. The untidiness is in ironic contrast to Dennis’s soon-to-be-revealed obsessive neatness. Something has caught his attention. Continuing the strategy of withholding information, the camera movement is so slow that it is only gradually unveiled that he is clearing away some rubbish. He picks up one piece at a time, possibly one of his OCD procedures, or perhaps the best way to ensure that his fingers are not directly exposed to the objects. Slide show: Casey sits like paralysed, only moving slightly. …and both girls are overcome. 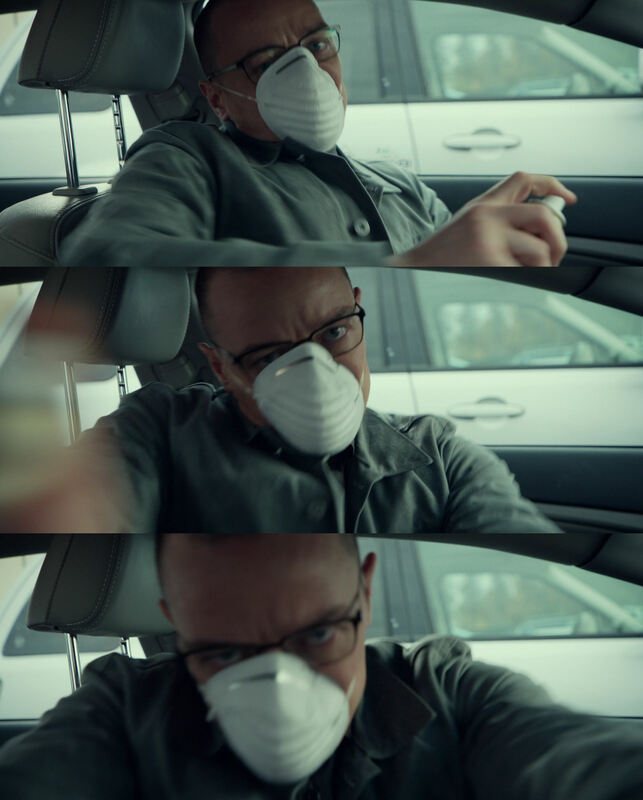 When he turns and extends his arm this happens very fast: possibly the footage is speeded up, but it is also possible that the Dennis personality is in possession of superhuman speed – later in the film, we see him rise abnormally fast from the table when about to leave for the railway station. Slide show: in another nice, “invisible” touch, the camera recedes from the frozen Casey, underlining her inability to cope. 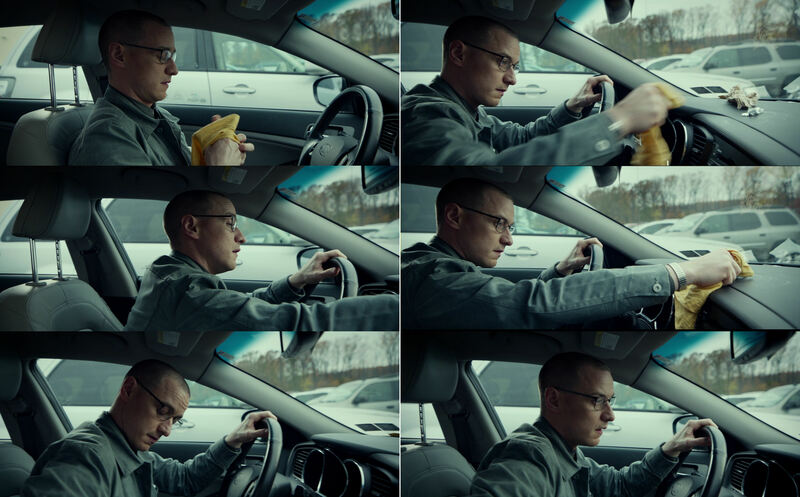 By the way, all the shots of Dennis in the car can be said to be from Casey’s POV, but here there is a slight (intended?) disconnect since she stares directly to the side, in-between shots that look towards the back seat. …while Casey sits like paralysed, just moving slightly. …while he is continuing putting away the rubbish, she is pressing the door handle. But since the motor is on, an alarm goes off, signalling someone trying to open the door. This brings the atmosphere back to reality, and the distortion of sound disappears. A slide show marking the progress of two consecutive shots: it is as if Dennis has noticed her presence for the first time. She sits, her breath shallow and fast, frozen with fear. …this is the last thing she, and the audience, see before the screen goes black and the title sequence starts. 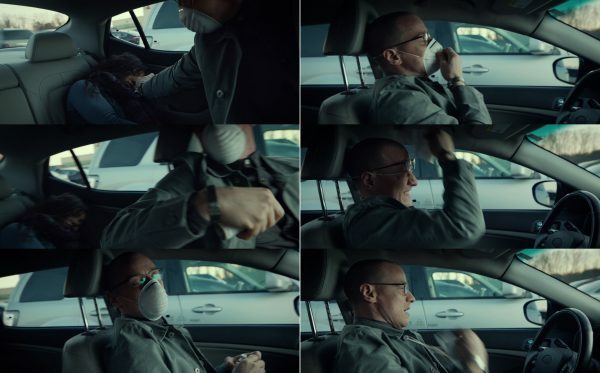 Comparing the first and last time they see each other: in the car one tear, in the cage during the climax two tears are falling – a finalisation or completion. 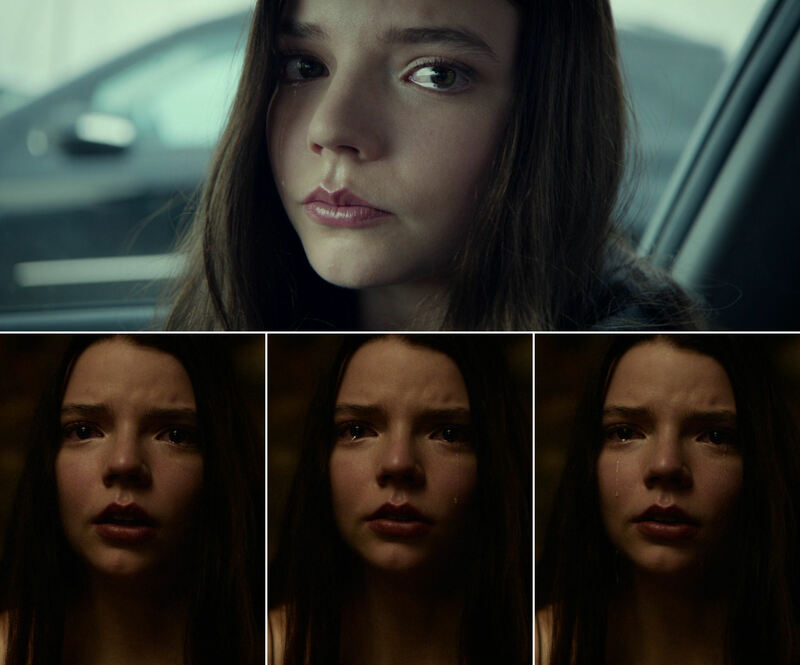 The fact that the tears first fall from one eye and then the other indicates reasoned contemplation, in strong contrast to another scene with prominent crying where she was lost in a trance of anxiety. 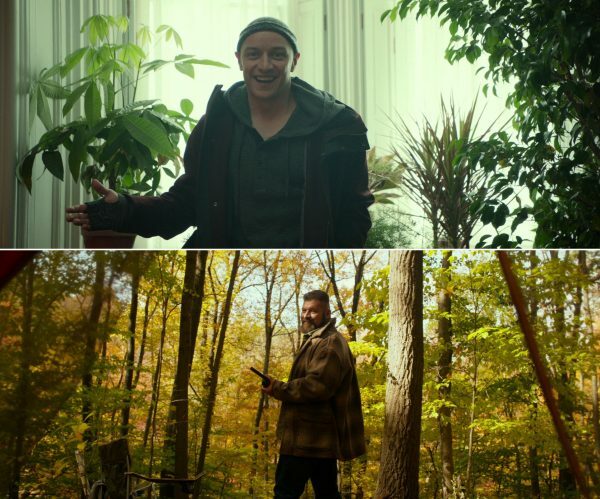 There has been some development in Kevin Wendell Crumb as well. Their meeting of minds in the climax feels paradoxical since they seemed to occupy separate planes of existence in the car. They never appear in the same shot: all frames are clean and pure, without the intrusion of a shadow or half-glimpsed body part of the other. It is notable, however, that the resolution happens through the bars of the cage, with a certain apartness being maintained. In the car she must be wondering why he has not gassed her. Is she so passive that he is pondering whether it is needed? Or is he planning to kill her, since she has seen his face? We must remember that he was only planning to take the other girls. Despite his inhuman stare, there is nevertheless a sense of a connection. Is he on some level recognising a kindred spirit, a fellow victim of abuse? …and, finally, between Casey and the dead deer in the third flashback. 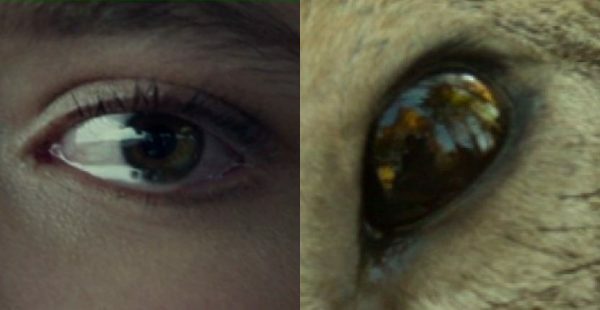 …like there was a reflection in the deer’s eye of the family of hunters standing over it, and it seems there is also a reflection in the older Casey’s eye in that last shot of her in the car. 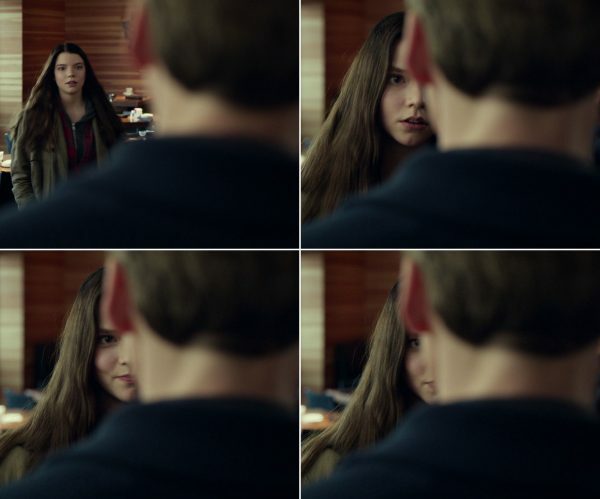 Could it be Dennis, the hunter, in the right part of her pupil? Are the two bright spots a reflection of his glasses and the area above them his shaven head? 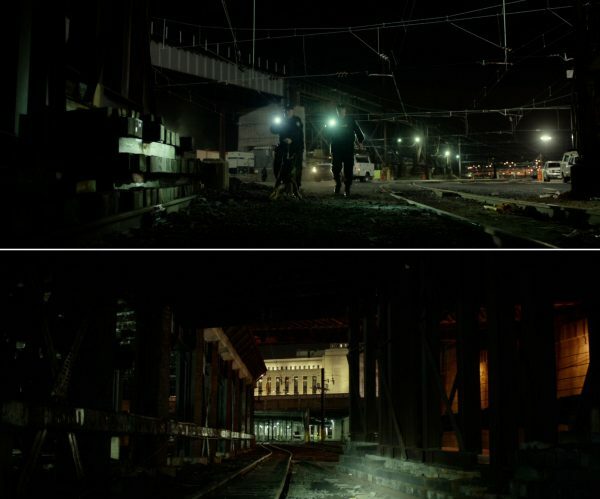 Like the transition to the first flashback, there is a connection between the third flashback and the next scene. The family look down at the dead deer, and when Casey wakes from the dream, Patricia is in the same position vis-à-vis Casey. There is an entire network of interconnectivity and interchangeability between hunter and hunted in Split. 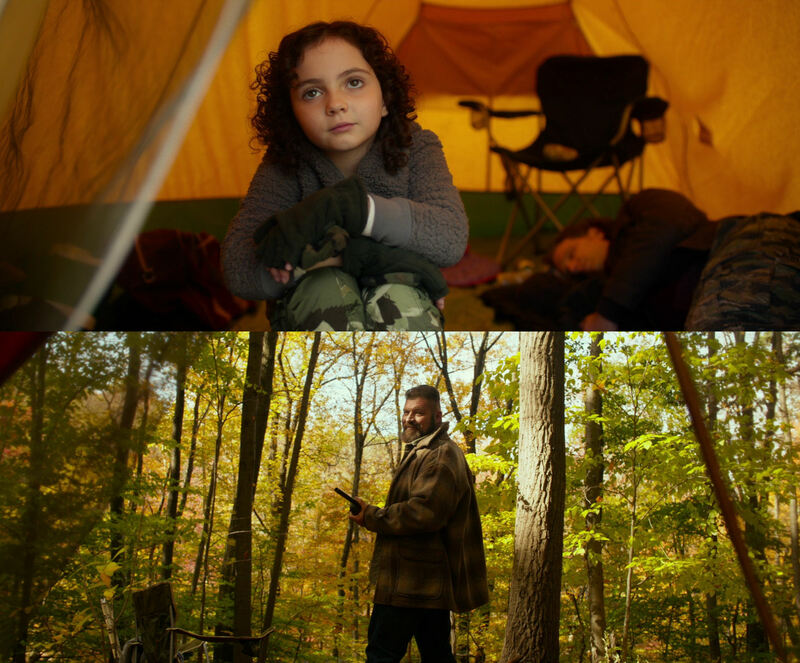 On their trip, the family hunt animals, but the uncle is also hunting Casey. The Horde are hunting for girls – Hedwig says Dennis “followed those two girls for four days” – and literally regard them as food. The name of the 24th identity, The Beast, alludes to the animal world and humans are prey for his cannibalism. To lure Casey into an abusive situation, her uncle says “let’s pretend we’re animals again.” And his “animals don’t wear clothes” and lack of clothes not only connect to the half-naked The Beast, as that identity eventually appears with his bare torso, but also to how the three girls are gradually stripped in captivity. 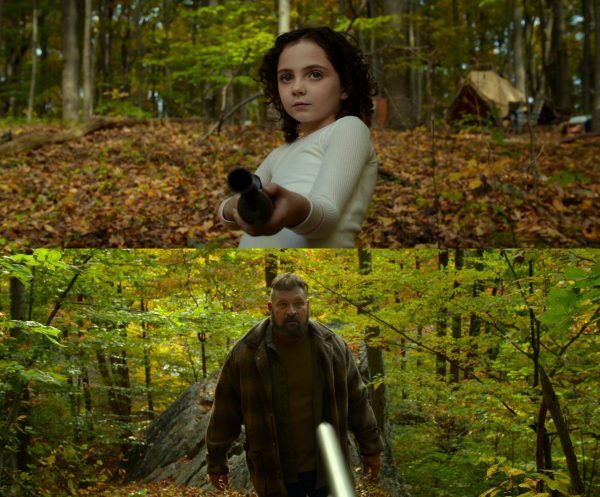 In the climax Casey is back to hunting again, brandishing a shotgun, in a situation where the status of hunter and hunted is again confused, since The Beast is at the same time trying to kill her. …even clearer if we look at the very start of the flashback, where the uncle loomed over her like they were looming over the dead deer in the previous flashback. 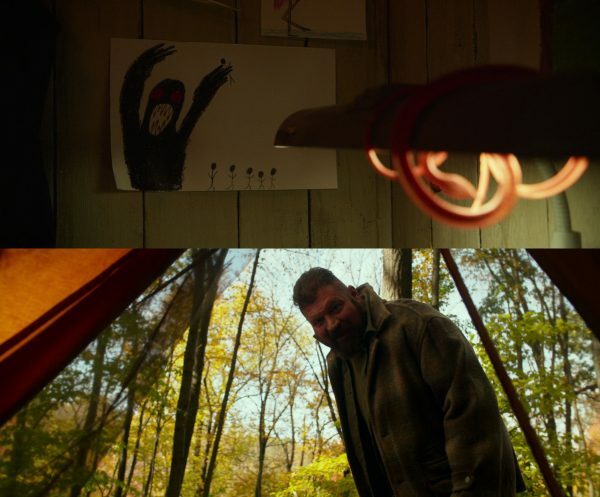 The transition to this flashback is also interesting, from Hedwig’s drawing of The Beast to its parallel figure, the bear-like uncle. The toy snake in the room’s foreground mirrors the uncle’s insidious behaviour. The tent opening forms a framing, which faintly echoes that of the drawing. After the abuse, in the second part of the fifth flashback, the roles are reversed – hunter has become hunted, in an ironic twist on her uncle’s let’s-pretend-we’re-animals ploy: as a continuation of the game, she might just shoot this animal. The red flowers (berries?) in front of the uncle are only seen here during the flashbacks. 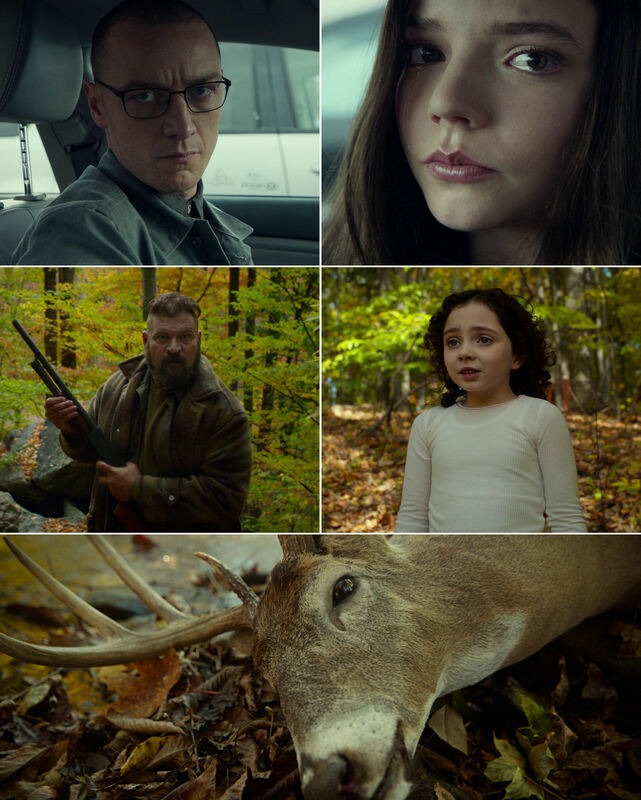 Although very discrete, it is inconceivable that Shyamalan haven’t thought of the connection to the “bad colour” of The Village, with its heroine in peril in a forest, the monsters that lurk there mirrored by the monstrous Beast, and by the parallel character of the uncle. It is also tempting to link the second flashback to the scene of a rescued Casey outside in the zoo. 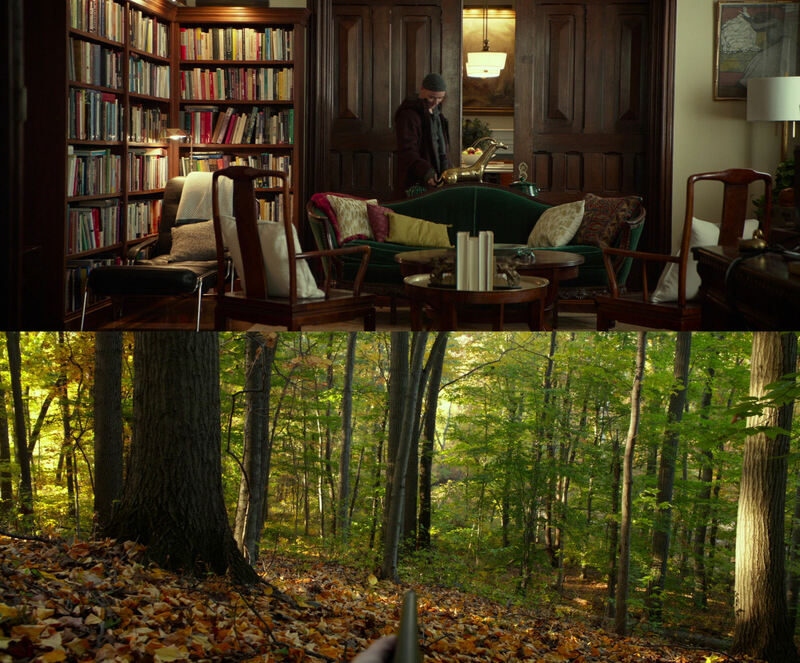 There is an echo of open spaces covered by leaves and the revelation that the world outside the basement is in autumn, like the flashbacks dominated by Casey’s predatory uncle, who is now her guardian and waiting for her outside. Finally, a look at that eye again: the reflection of Casey’s uncle appears only as a black silhouette, very much like Hedwig’s drawing of The Beast, a tormentor like her uncle. There might also be a small motif around the number three. 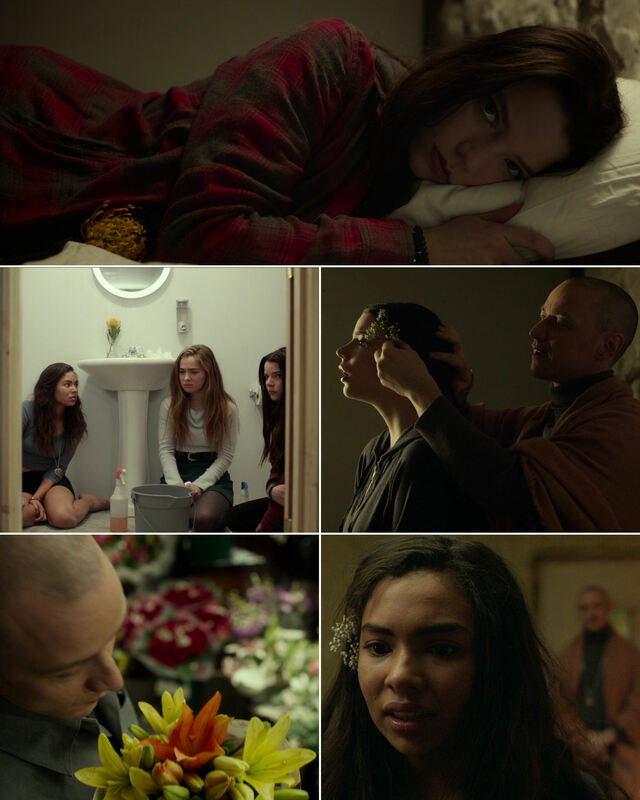 Split features three prisoners, three psychiatric sessions, three murdered characters, three member of The Horde (Dennis, Patricia, Hedwig), three strata of enclosed spaces (cell, anteroom, entire basement), and (as we shall soon see) three corridors. Dr. Fletcher’s office is on the third floor. …the same one through which the girls are transported in the drugged-out shots stitched into the title sequence (top). The bottom row shows the main corridor and the tunnel. General layout and sizes of the various units are inaccurate. The tunnels are longer and the cage much further away. Claire crawls out through the air duct and ends up in the same tunnel that Casey entered after she managed to open the door from the living room. 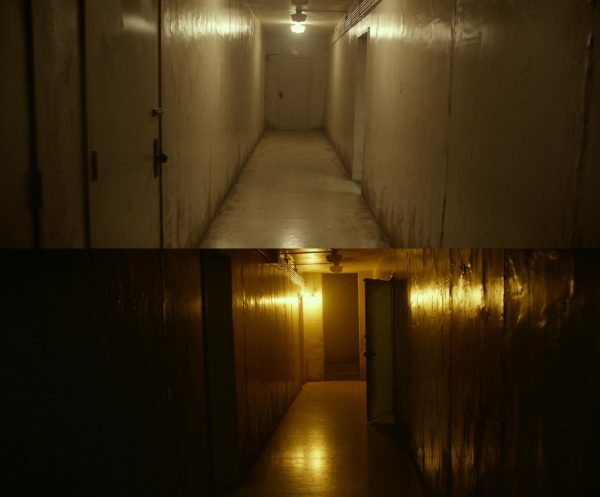 It is impossible to determine from the film how the outer corridor fits in. …while this slide show catalogues the general strategy, the characters dwarfed. These are moving point-of-view shots down the fateful corridor, respectively from the eyes of Dr. Fletcher and Casey. The only other scene in the main corridor with close shots is the brief but intense confrontation after Dennis has discovered that Dr. Fletcher has found the prisoners. Pipes are also piercing Hedwig’s room, adding visual personality. The air duct through which Claire is crawling during her escape from the cell is another variation on the corridor motif. This breaks down the situation (the slide show is capped off with same door as the police enter the premises in the film’s aftermath). 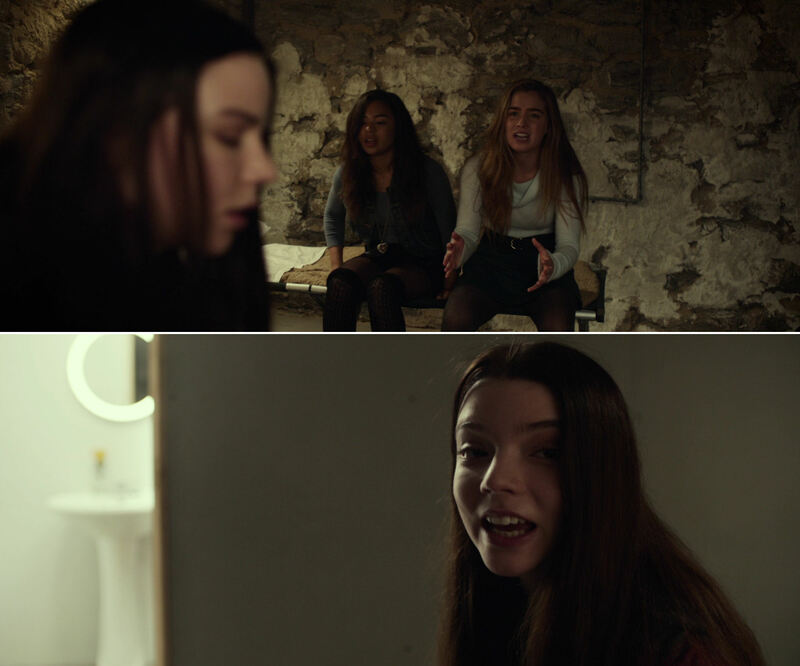 As punishment for their escape attempts, Claire and Marcia are imprisoned in each their closet, cramped spaces marked by a small labyrinth of lines and angles. 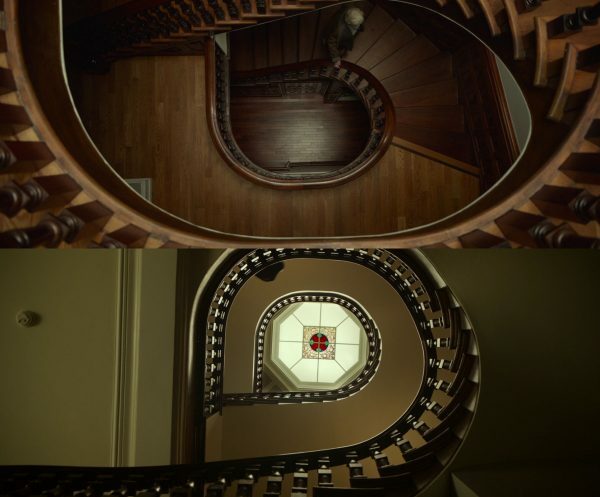 Returning to the corridor motif and moving out of the basement, these stylised shots penetrating Dr. Fletcher’s staircase from above and below are clearly variations of the motif. The motif can be extended to include “corridors” of terrain receding into the distance. 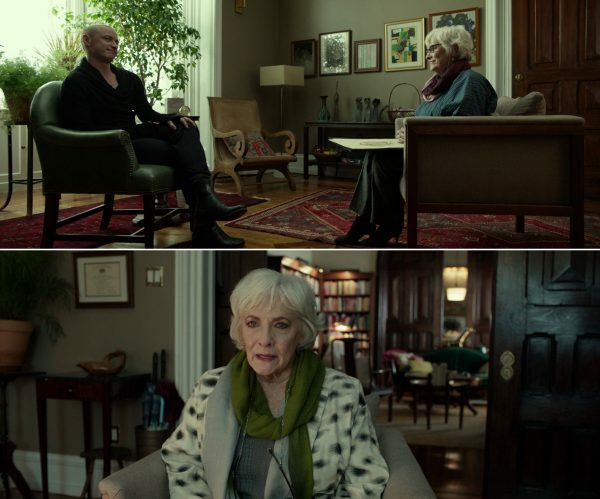 Except when she is waiting in the park, every shot of the sequence where Dr. Fletcher is leaving the office to meet Joe, a fellow psychiatrist, seems composed to contain this feature, including the staircase. The same shape returns in other shots. The reason for the high angle on Dr. Fletcher and Dennis seems to be to capture the corridor shape, receding in two parallel bands. At the railway station we find it on the platform itself, in the yellow stripe, and in several versions on the train. 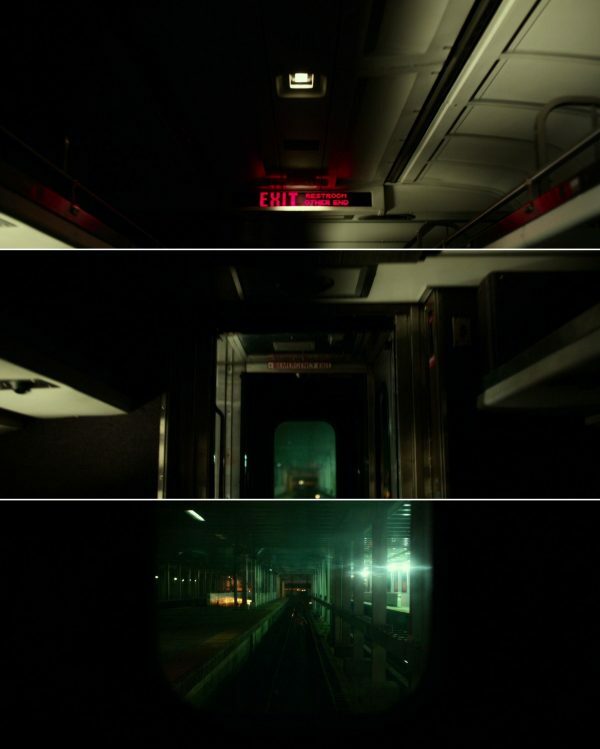 Inside the train, where Dennis will transform into The Beast, the car forms another corridor. In a way, Dennis is still in the basement. After the transformation, The Beast leaps up on the roof. As he starts running on it, the camera is following him inside the car, maintaining the corridor motif, and captures him after he has jumped down to run away inside the track, another corridor shape. The motif is still governing the composition, just afterwards, where the watchmen’s dogs are sensing the presence of The Beast. 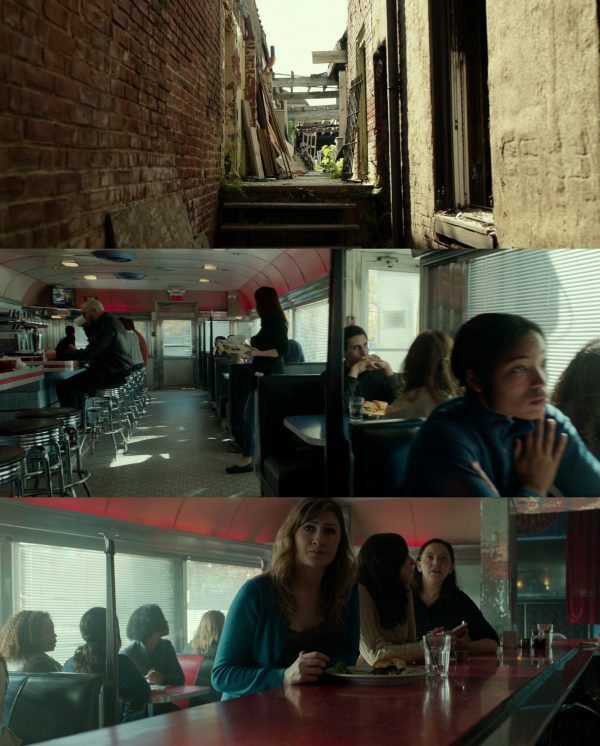 Jumping ahead to the epilogue, it is also present in the approach shot to The Horde’s hide-out, and in both shots inside the diner, in the last one via the counter. After the climax, a zoo employee comes along to discover Casey inside the locked cage. For once, a corridor character is shown in a close shot. This straightforwardness of presentation seems to signal a return to normalcy for the heroine. Slide show: As if to bring the film’s whole conglomerate of imprisonment, corridors and doors to a careful closure, Casey and the zoo worker are seen to navigate an array of doors and passages, accompanied by various cages, but now filmed in a casual and non-stylised way. At the same time, the animal noises and sight of cages create a strong sense of bewilderment and alienation, until it gradually dawns upon us that we are inside a zoo. Imprisonment issues refuse to let go: the zoo animals have a corridor of their own. 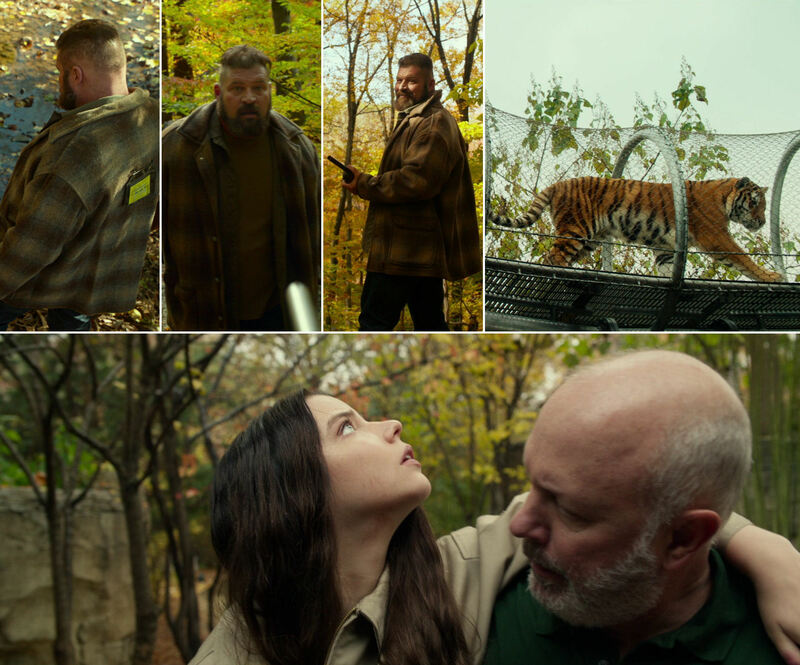 There is also an uncanny resemblance between her uncle and the tiger: both are predators and his jacket’s pattern and colour are reminiscent of the animal. When Casey has nicked Hedwig’s walkie-talkie, calling frantically for help, a great many shots have precisely a tiger in the background, as if a harbinger of the one that will mark her freedom. It is merely hinted at, but as Casey is rescued, there is a resonant interplay between various thematic strands of imprisonment, for example in the contrast between Casey’s freedom and the eternally trapped zoo animals, like The Beast too will be if the authorities can catch him. Kevin’s life as a zoo employee has inspired the emergence of The Beast, whose goal is recognition and respect, as well as transcendence of the limitations of being human. The Beast acts like lions and tigers will if they get out, they will kill on instinct. The Beast wants to eat the girls, like humans do with animals. Finally, a zoo is a collection of cages, like the cell with the girls and the cage of the climax, and there is also a similarity with the folders on Kevin’s computer: one compartment for each personality. Kevin’s personalities, neatly compartmentalised. The numbering is the same for Dennis (8), Hedwig (9) and Patricia (11) here as on the folders in Dr. Fletcher’s archive. It is not surprising, then, that Split is rife with animal imagery and references. 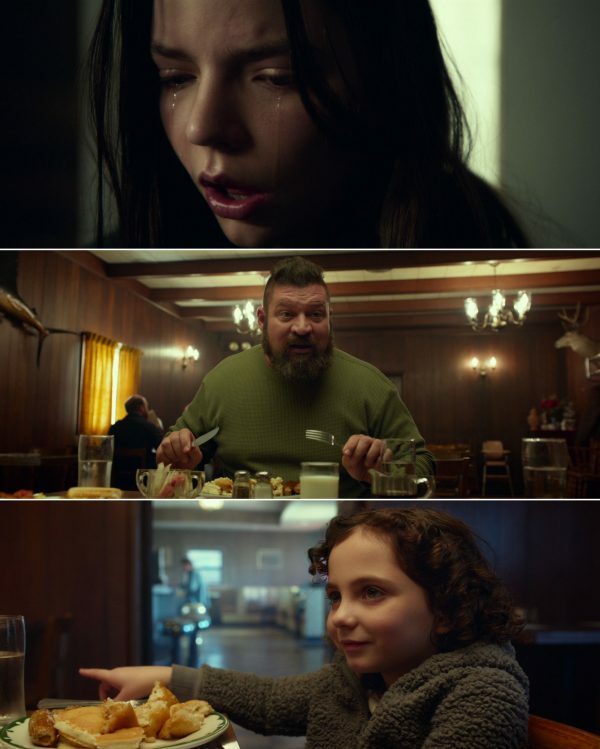 Patricia (in the kitchen scene): “Do you know, a family of lions can eat 35 pounds a day?” Casey: “A buck can lose 30% of its weight during mating season, chasing does around.” Patricia: “I don’t know if you know, but tigers have only 30 teeth. That’s 12 less than a dog. I thought that was a fun fact.” Dennis describes The Beast thus: “He’s much bigger than I am and I’m the biggest of all of us. He’s tall. He’s very muscular. And he’s got a long mane of hair and his fingers are twice the length of ours.” (The long mane of hair is a description that also fits Casey very well.) Dr. Fletcher concludes: “He is formed because of your time in this place.” Patricia’s above obsession with animals may also have played a role. The connections between the The Beast and the zoo, and thus animals, are clear. And Split does not get any less complicated by the fact that The Beast, himself one of 24 personalities, is an amalgam of various animal species, with their differing personalities and traits…! This is very subtle: the maker of this video has found that the box behind Hedwig is one of the film’s earliest hints about the animal connection: it contains the animal-shaped Barnum’s Animal Crackers. He also points out that the song Hedwig is dancing to is called “Frogbass” performed by Snails, and its music video portrays a war between animals. This goat statue is lingered on as Dr. Fletcher waits for Joe in Rittenhouse Park. 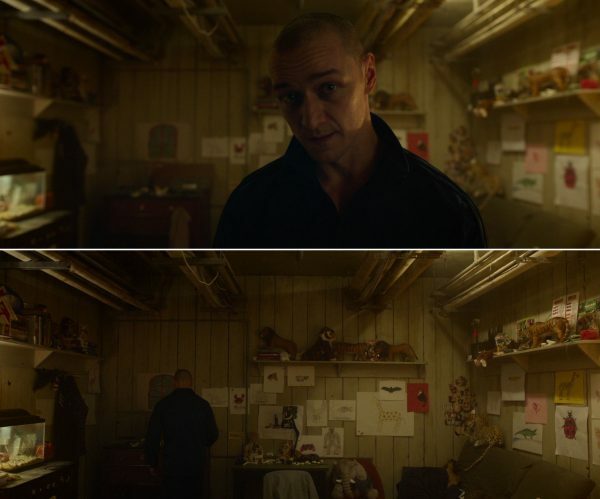 The walls of Hedwig’s room are peppered with drawings, virtually exclusively of animals, and he has a large collection of animal figurines and toys. Like Patricia’s fountain of trivia about lions and tigers, all this is of course inspired by Kevin’s time working at the zoo. (Hedwig is thus sharing Barry’s artistic inclinations; the latter is doing fashion sketches). Late images: (top) a cut-away before the police enter The Horde’s lair; (bottom) a bridging shot between the Casey police car scene and the epilogue (the piece from the Unbreakable score starts here). 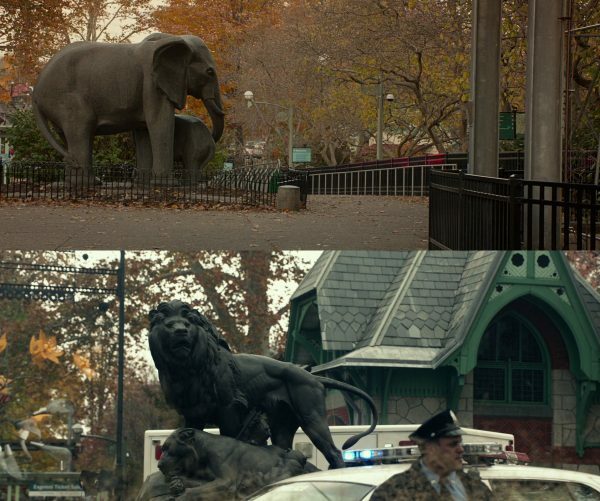 These are well-known statues at the Philadelphia Zoo: an elephant and a cub and “The Dying Lioness“. The Fairmount Park Art Association’s Annual Report (1876) says of the latter: “the maternal instinct, stronger than death, [which] has caused the dying lioness to give her last strength to the nourishment of her young; over the mother and the whelps stands the lion, the prominent figure of the group, who roars defiance, grief and rage.” The elephant and the lion statues, and their protection of weaker family members, can surely be connected to The Beast and his gang of weaker personalities (The Horde), and to Kevin and Casey’s absent/dead fathers. Two of Hedwig’s drawings of The Beast: the first one in Dr. Fletcher’s Hedwig folder – a virtually identical one is in his room just above the elephant on the chair – the other drawing hangs in his room and serves as transition to the fourth flashback. The child-like stick figures being taken by The Beast in the drawing also resemble stylised flowers, for example the ones in the cell: in the bathroom and on the cots. These are pincushion proteas, named after Proteus of Greek mythology, who had the ability to change shape, which fits well with the body-altering properties of Kevin’s personalities. …the flowers are visible in every shot of the captives. 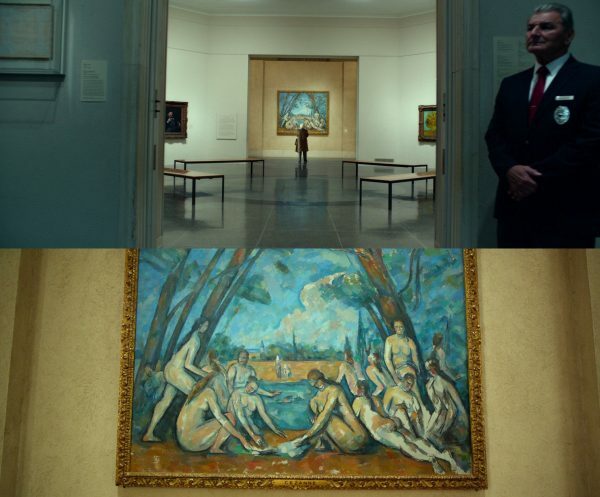 …while he is associated with nature, Dr. Fletcher is linked to art, science and civilisation. 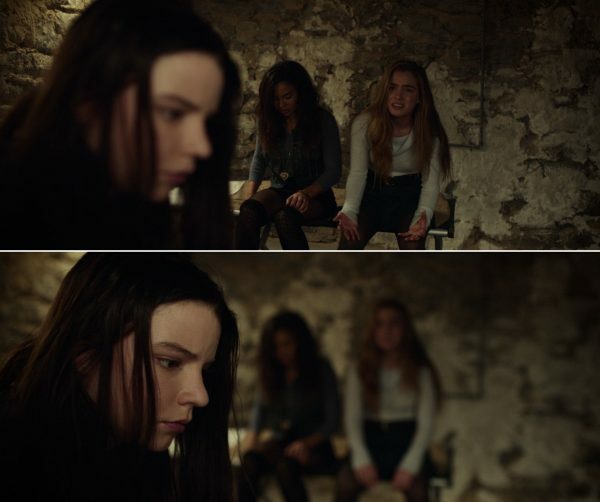 Except for the top shot from session 2, which is expressive of this division in its own right, all shots of her in session 2 and 3 are locked against the background of her library. …even though Dennis’s sexual predator proclivity is rather mild, he will eventually turn into The Beast. His plant connection provides a chilling link to another predator, who is always connected with the outdoors. Furthermore, The Beast must be said to be strongly linked to animals and thus nature, so it makes perfect sense for Dennis to be connected to all this greenery. Surprisingly, there is also a connection to nature in the early part of session 1, where Dennis is not linked to plants at all. Here Dennis is pacing around in the library section of the office, like an animal trying to hide in the landscape – pretending to be Barry, he keeps his distance to the psychiatrist – and he is far into the depth of the shot, corresponding to the level where an animal might turn up in the forest outside the tent in the second flashback. The connection is strengthened by that flashback being positioned just prior to the session. (In between there is just a brief return to the cell, where Casey’s line “I’ll let you know when I hear something that makes sense” is an approach shared by the psychiatrist too.) Dr. Fletcher, the “hunter”, is looking for signs of her patient’s mental state, trying to “outsmart” him. Although they are staged in a wholly stationary fashion, the psychiatrist will adopt this hunter approach in the other sessions as well. Returning to those disgusting plants in the opening shot, we find they are called snake plants (which feature prominently in Isabella Rossellini‘s not exactly joyful apartment in David Lynch‘s Blue Velvet from 1986). Not only are they neatly fusing the animal and flower/plant motifs, but with such a powerful connection to The Horde, their presence strengthens the theory that this shot is from the abductor’s point-of-view. At the very least, the greenery represents the looming threat, their tentacles even specifically surrounding the heroine. We shall revisit Dr. Fletcher in the third article, which collects everything to do with the psychiatrist and her patient, in addition to rounding up lots of references to M. Night Shyamalan‘s earlier films. 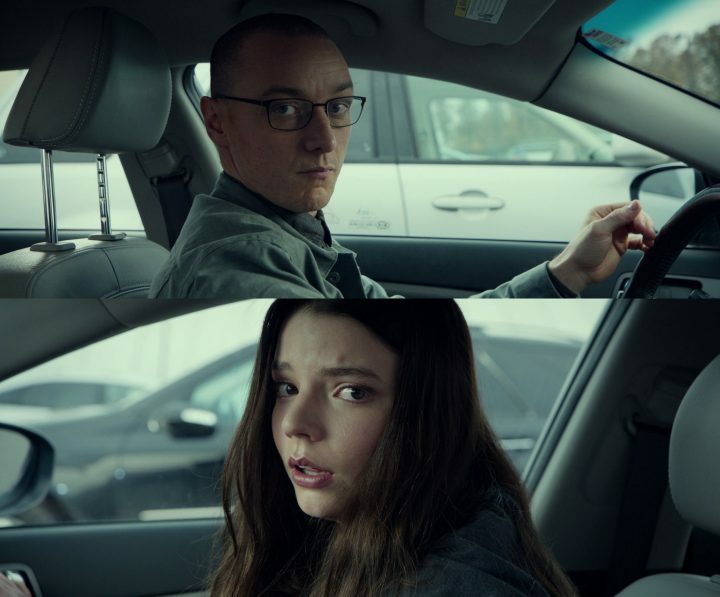 Even though Split is not as formally audacious as his early works, its apparent simplicity, as we have already seen, conceals a surprising amount of ideas, refinement and subtlety.